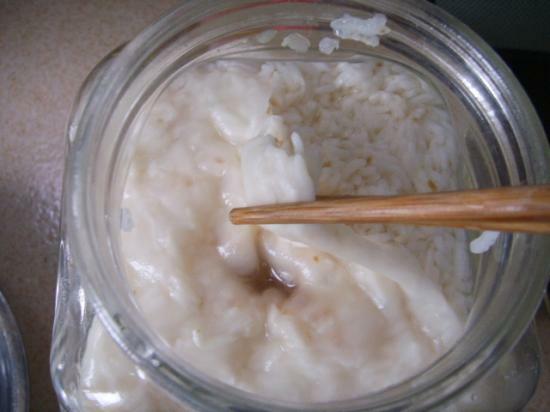 Chinese fermented rice (Chinese people usually call it Jiu Niang) is also known as sweet wine and fermented glutinous rice, after the Rhizopus, Mucor and yeast have done their work. If you ferment the rice yourself, the biggest advantage is that you have control over the final product. If you would like it rich, you can let it sit for a couple more days. If you would like to eat a milder version, let it sit for less time. When you eat fermented rice, the nutrients are more easily absorbed into the body. The elderly, pregnant, and the weak will find it nourishing and refreshing as it contains a lot of good bacteria, helps relieve fatigue, quenches thirst, promotes blood circulation and has an overall soothing effect. 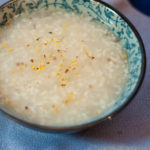 The fermented rice can also be used for many other purposes such as in bread instead of yeast, or you can use it to cook eggs and dumplings, etc. Fermented rice will give a fresh, fish-type aroma to your cooking. 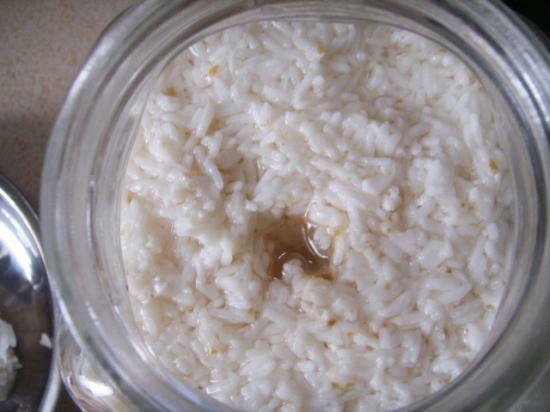 You can also use fermented rice to replace cooking wine in soups, stews, boiled fish, etc. It is a lot stronger, but also more nutritious. 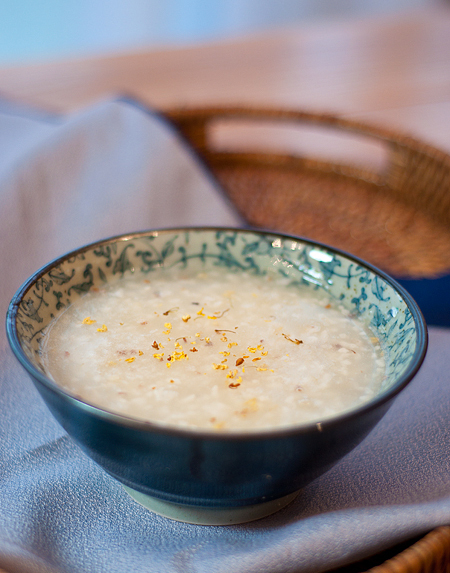 To make fermented rice, we must first understand its principle. Sweet fermented rice is formed from the synergism of Rhizopus, which produces glucoamylase, which in turn transforms the starch in glutinous rice into glucose. The yeast then turns the glucose into alcohol, which gives the brew its sweet, mellow taste. The carbohydrates are broken down into simple sugars (saccharification), making the rice sweeter. After reaching the peak saccharification, the sweetness fades and the wine becomes thicker. Sour: Saccharification is the first step in the brewing process and then the formation of alcohol. 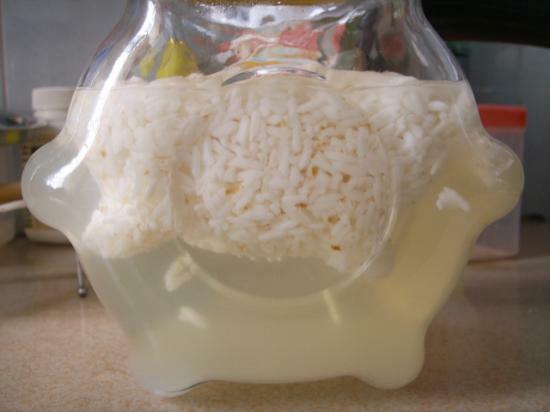 If you ferment the rice for too long, the alcohol will turn to acetic acid and become sour. Bitter: Some people think that fermented rice is bitter because they have used too much rich wine starter. I have never put too much wine starter in, and have always followed the instructions, however, I have still had bitter results. My analysis is that the bitterness comes from contamination by miscellaneous bacteria, that move into the rice through utensils and hands that have not been washed thoroughly, from oil, or it may be the process of opening the container during the brewing process that lets bacteria in. Also, if the glutinous rice is not steaming, it is likely to produce bacteria. Black color: This happens when the wine is contaminated by bacteria. Many kinds of bacteria have an exclusive nature, that is, when a bacterium is activated, its metabolites can inhibit other bacteria. 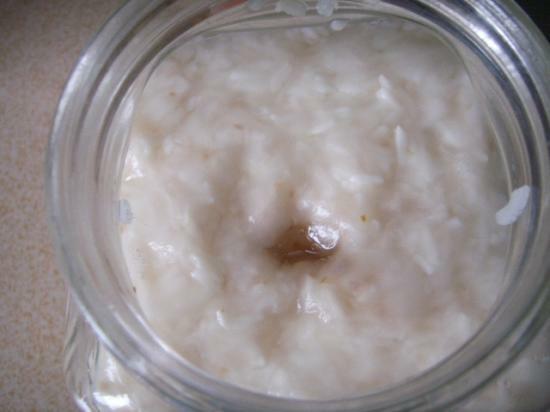 Therefore if the activity of the rice wine starter is high, fermented rice is not easily contaminated. On the contrary, if the fermented rice is contaminated by bacteria at the outset, then the rhizopus and yeast will be inactive and the fermented rice will not become sweet. Instead, it will become black and develop a bitter taste. Alcoholic, not sweet: There are three possible causes for this: firstly, over-fermentation, which means that the sugar is converted to alcohol. The second reason was mentioned earlier: the saccharification was inhibited, meaning that the starches in the glutinous rice were not fully converted to glucose and the limited sugar turns to wine. This is usually the case when the air is completely isolated from the brew. Rhizopus requires oxygen while it is anaerobic. If there is none, the activity of the yeast will be inhibited and saccharification cannot be completed. Thirdly, there is a possibility that the ambient temperature is too high. Rhizopus thrives at 28-30 degrees and yeast at 30-35 degrees, so if the temperature is too high, the Rhizopus will not be very active and the yeast will still be alive. Supplementary temperature control: 30 degrees is the most suitable temperature for saccharification and formation of alcohol; if it is too high or too low it will cause the bacteria to become less active. If the temperature gets too low, and the wine brews for too long, the chances of the wine becoming contaminated are quite high. If you have to choose one, low is better than high temperature. If you understand the reasons for any problems and try to avoid them, you can make the sweetest wine. Now we will discuss the process of making wine. 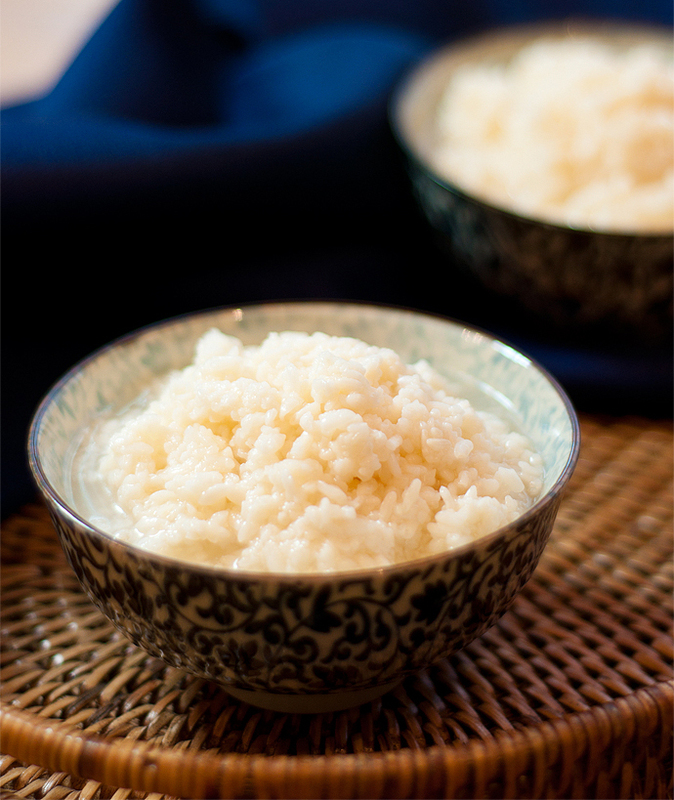 Wash the glutinous rice twice and then soak it in a clean container in water for six to eight hours. Find a clean gauze cloth and boil it in water for 10 minutes to disinfect it. Take the gauze and put it into the bottom of the steamer and pour the soaked sticky rice into the steamer. Use some chopsticks to make some holes in the rice. Steam it on a high heat for about 40 minutes. Cool the steamed rice to about 30 degrees. Pour the rice wine starter into the cold water. 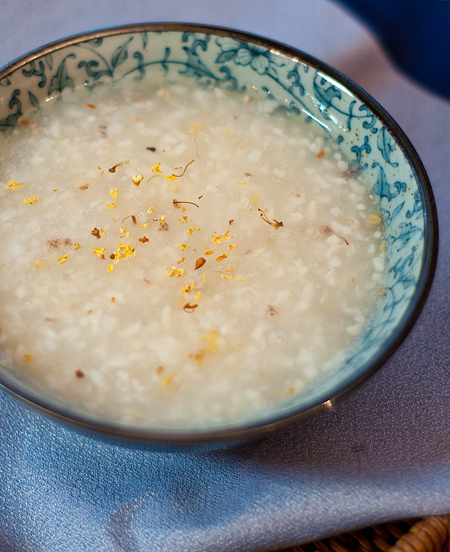 Pour the rice wine water slowly, bit by bit, into the glutinous rice. Stir the rice from the edges inwards to gently loosen the clumps. Keep stirring until the wine is completely mixed into the rice and there are no clumps. Find a clean container with a lid, pour the sticky rice into it and put a hole in the middle of the rice right through to the bottom. Close the lid, but do not seal it. Allow the rice to ferment for 36-48 hours in a warm place that will stay at 30 degrees Celsius. Open the lid to check the rice. If the rice is floating up, and the hole has a clear liquid seeping out, then you have a fragrant wine. Use round glutinous rice since it will be sweeter than long glutinous rice for making Sweet Fermented Rice. Different brands of wine can be used in different quantities. Follow the instructions. While you are making the rice, be sure that all your appliances and tools are washed thoroughly to avoid any oils and bacteria. It is best to wear disposable gloves to avoid contaminating the mixture with with your hands. Put some small holes in the rice while it is steaming as this ensures even cooking. Wine cannot completely dissolve in water, so stir the rice while you pour the wine water in as it helps distribute the wine evenly. Do not add too much water and do not mix the rice into excess water. Control the fermentation temperature at 30 degrees, no more than 35 degrees. To hold this temperature, I heat the oven to about 35 degrees, put the rice in and shut the door, turning off the heat immediately. I will reheat the oven every 6-8 hours. The reason why the oven does not maintain the right temperature is that my home oven temperature is quite high. If I set it to 30 degrees, it will actually measure about 40 degrees. To ensure an accurate heat, use anoven thermometer to avoid failure or lack of sweetness in your rice. When you mix the combined wine and rice well, and put a hole through the middle, it helps prevent uneven heat through the rice and allows the saccharification to be carried out thoroughly. You can also stir in the wine water after 24 hours so that the Rhizopus can be fully oxidised. It is best to eat the rice within three days (the sweetness of the rice is at its maximum). The rice will continue to ferment otherwise, and with the conditions well controlled, will become alcoholic with about 10% alcohol. You can drink it, or use it as a cooking wine. A good brew will need to be kept in the refrigerator. You can maintain the flavor this way for a week. If you keep it in the refrigerator for longer, it will slowly become rice wine after about two to three weeks. Rich bouquet, clear liquid and sweet as honey. Rice will be hollow and have texture without being raw. 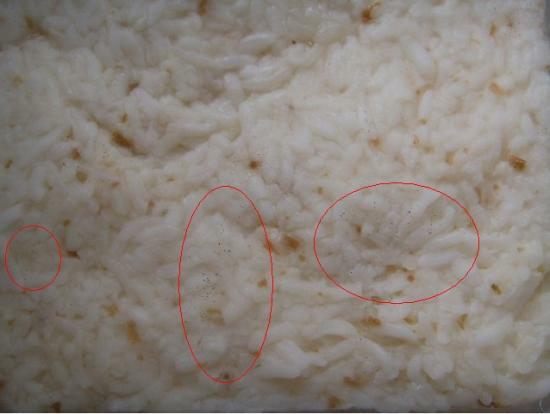 If the rice forms tiny black or green hair-like mold (see the picture with the red circles below) it is an indication that you should not consume it. If there is a layer of fuzzy white mold (see figure two) it means the temperature is too low. You can remove the layer (figure three) and continue to eat the rice. Figure four shows uncovered fermented rice. Wow, this is definitely something I would like to try, it sounds unique and interesting.